Currently about 1 billion people worldwide are smokers, making the cigarette the leading cause of preventable death. One in ten deaths on the whole planet is related to tobacco. This means 6 million deaths per year or one death every 6 seconds happen due to diseases caused by smoking. To get an idea of the tragedy that the cigarette is, more people die from smoking-related diseases than from AIDS, breast cancer and auto accidents together. Annual spending in the world on health problems caused by smoking exceeds $200 billion. People who smoke consume on average 40% more resources in health systems than nonsmokers. Meanwhile, companies that sell cigarettes such as Philip Morris, have higher profit than Nike and McDonald's. Brazil spends nearly half a billion dollars on the treatment of smoking-related diseases. 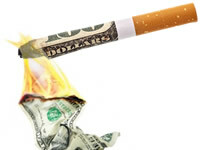 In the U.S. studies show that every dollar invested in smoking prevention programs, $50 is saved in the health system. Therefore, one can say that smoking also causes "cancer" in the health budget. The main causes of death are tobacco-related cardiovascular diseases, lung cancer and COPD (emphysema and bronchitis conical). A longtime smoker has a reduced life expectancy of about 13 years, and at least 50% of smokers will die from a disease directly caused by smoking. In the U.S. one third of cardiovascular diseases, including heart attacks and strokes, are caused by smoking. A single cigarette contains about 5000 chemicals, at least 400 of which known to be toxic to the body and more than 50 known carcinogens (causing cancer). Among the harmful substances that are absorbed when smoking a cigarette include: methanol, arsenic, methane, ammonia, cadmium, hexamine, carbon monoxide, tar and nicotine. It has been proven that passive smoking can lead to the same diseases as active smoking. Therefore, the anti-smoking laws, increasingly stringent worldwide, are not just a matter of non-smokers bothered by the smell of smoke from smokers. It is a matter of personal and public health. Lung cancers in nonsmokers are uncommon, but most of these involve people who live in the same house with a smoker. 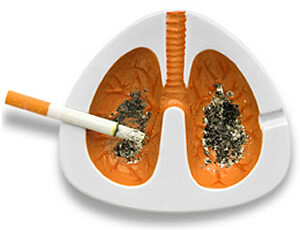 90% of lung cancers occur in smokers, the remaining 10% are largely observed in the passive smokers. A non-smoker married to a smoker is 20% more likely to die of lung cancer and heart disease than non-smokers not exposed to passive smoking. Non-smokers who live with smokers have a mortality rate up to 15% more than those without frequent contact with the cigarette. Children of parents who smoke, that are exposed to secondhand smoke for at least 25 years, are twice as likely to develop lung cancer. Newborns exposed to smoke during pregnancy have nearly 4 times more chances of sudden death. The risk of fetal malformation in smoking mothers is also higher. Pregnant women exposed to secondhand smoke have babies with low weight at birth. 72 hours - Improves breathing. 1 month - Increases skin perfusion improving their appearance. 3-9 months - Respiratory problems, such as cough, disappear. Pulmonary function increases by 10%. 1 year - Risk of heart attack is halved. 10 years - Risk of lung cancer drops by half. 15 years - Risk of heart attack is equal to that of nonsmokers. After 15 days of abstinence from cigarette cancer risk drops by 90%, however, it will never be the same as those who never smoked. ATTENTION: There is no safe amount of cigarettes. Those who smoke are subject to all these risks, it's just a cigarette or three packs a day. Obviously, the higher the number is, the higher is the risk. Some scientific studies have attempted to evaluate the benefit of reduced tobacco intake by 50% as an alternative for those who have difficulty quitting. Mortality remains the same. The benefits only occur for those who abandon the addiction. About 20% of the adult population smokes. 70% of them, when asked, express a desire to quit smoking and 40% said they had already tried at least once to kick the habit. The success rate, however, is less than 10%. Some substances such as coffee and alcohol serve as triggers for cravings. At the time you decide to try to quit smoking it is important to remember that the act of smoking besides being a physical dependence, it is also a learned behavior that can simplify calling a "force of habit". Therefore, psychological treatment can be as important as the drug, described below. A person has to really want to quit smoking. One can deliver nicotine without the cigarette through skin patches, chewing gums (gum) or nasal spray. The amount of nicotine afforded in this way is less than in the cigarette, so it ends up being easier after quitting smoking and nicotine replacement therapy than cut tobacco and nicotine at once. Bupropion is an antidepressant especially effective in controlling nicotine dependence. The treatment is normally done within 12-24 weeks. The Varenicline is a drug that acts on brain receptors for nicotine, it "fools" the brain to think it is receiving nicotine. The treatment also lasts for 12-24 weeks. Attention: Both Bupropion and Varenicline are drugs, therefore, can have side effects and have some contraindications. One should not take these medications on their own, without medical evaluation or risk of serious adverse effects. The addiction to tobacco is made with medical advice associated with drug therapy. When dissociated from each other, the results are not good. Did You Know Cigarettes are Radioactive?